ThermaWing™ - RESEARCH. DESIGN. DEVELOP. ThermaWing™ is the choice for safety when dealing with ice hazard prevention. Technology usually limited to jets is now made available to the general aviation community and a proven solution to ice build-up. Through research, with NASA assistance, Kelly Aerospace Thermal Systems has developed the ThermaWing™ system; a lightweight, easy-to-install, reliable deicing system. This new flexible, electrically conductive, graphite foil technology has none of the drawbacks or limited effectiveness of the boot or weeping wing. Instead of the chemical mess of liquid deicers and the added weight/performance drag of boots, the ThermaWing™ covers a large surface area without significant weight penalties and instantly sheds ice. Once armed the ThermaWing™ system will activate at 41°F starting the deice cycle. An exact concentration of heat breaks the bond between the ice and heater surface during each cycle. Energy is controlled across the system so the leading edge and shed zones can be heated according to need. Thus making ThermaWing™ the most advanced aircraft deicing system available on the market today. Columbia with the best deicing system. The outer layer of the laminate is a heat-conducting Tedlar® a very thin ice phobic. 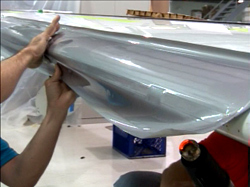 It offers a unique balance of aesthetics while offering the durability of a fluoropolymer. A zoned heater system is utilized and controlled by a solid-state processor. The impingement area, or leading edge, is kept warm continually melting impinging ice, or simply, "runs wet". The area just aft of this impingement area, or shedding zone, is kept below freezing causing the run back to freeze and collect as ice. During a de-ice cycle the voltage is increased raising the temperature of this aft shedding zone, releasing the ice bond and shedding the ice via aerodynamic force. Once power is removed from the heater the shedding zones immediately freeze and continue to collect ice until the next de-ice cycle. This system may take as little as 1 second per surface and only 33 seconds to deice the entire aircraft using a 60 second cycle. Columbia/Cessna 300, 350, and 400 STC complete. Available Now! 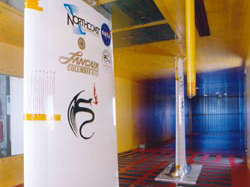 The current FAA certified heater element configuration was the result of extensive heater development, electronic control system design, and wind tunnel and flight testing. 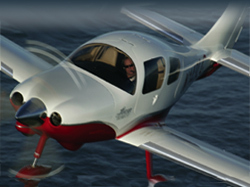 The launch customer for the system was Columbia Aircraft Manufacturing (now Cessna) which utilizes a high performance, state-of-the-art composite airframe which offered unique design challenges. On the Cessna 350 and 400, The ThermaWing™ System utilizes 6 heaters, 3 heater control modules, one main electronic controller, and one 7500 watt alternator to deice the aircraft.